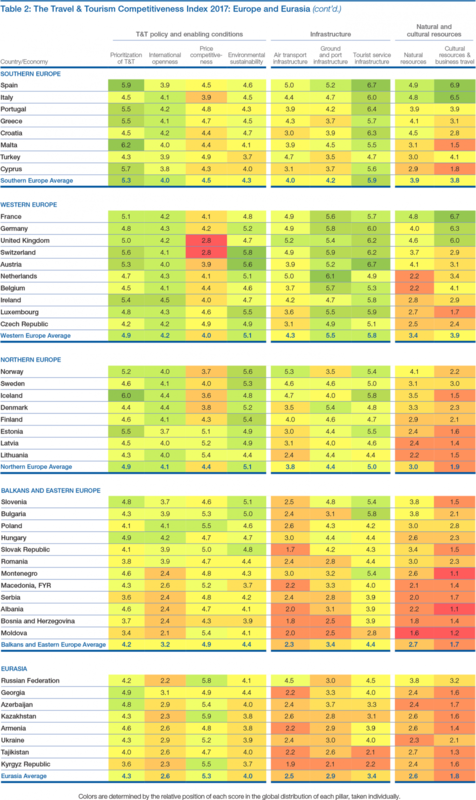 Europe is once again the region with the strongest overall T&T competitiveness performance. It boasts six of the 10 most competitive countries in the T&T sector, and attracted 620 million of the 1.2 billion international visitors in 2016. 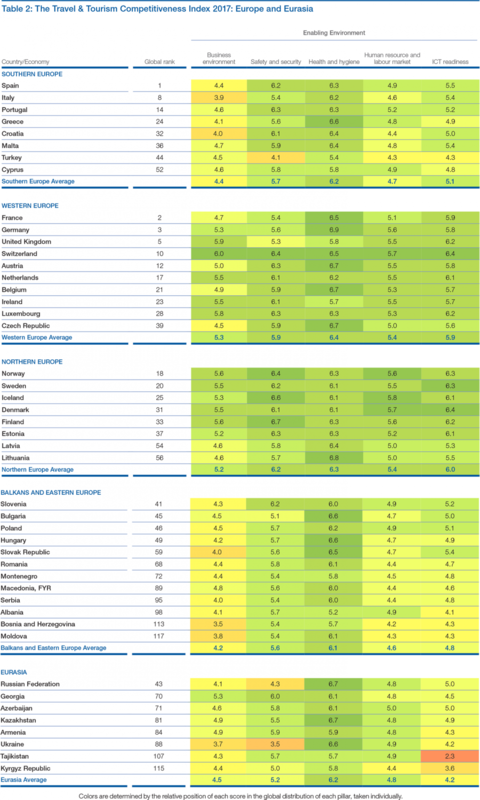 While the region continues to improve, it does so at a slower rate than other less mature regions. Yet, to date, Europe remains the largest T&T market, almost twice as large as Asia-Pacific, the second largest and rapidly growing market. While the number of arrivals continues to grow in Europe, international receipts started to decline in 2015, suggesting possible re-adjustments in the sector at the regional level. Different hypotheses can be put forward to explain this phenomenon. For instance, given the importance of intra-regional travel, lower spending may reflect lower purchasing power and more attention towards lower-cost travel solutions. At the international level, shifts in international arrivals from North America to Asia may entail shifting spending patterns. As these trends evolve, the continuous improvement of the sector’s competitiveness will be essential in light of the industry’s transformation, especially in the more mature destinations. To date, strong health and hygiene conditions, cultural richness and safety are common T&T competitiveness advantages across the majority of European countries. Despite slightly declining security perceptions in Western and Southern Europe resulting from the recent terrorist attacks, the impact on international arrivals was only short term. 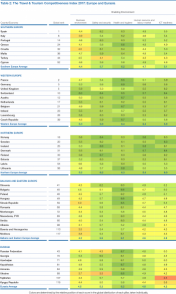 Since the last edition of the Report in 2015, many European countries have reduced their attention to the T & T sector as suggested by indicatively lower T&T prioritization scores 10 At the same time, the region has improved on many factors, including ICT readiness and price competitiveness. These improvements have counterbalanced some of the less positive trends in public investment in the sector and security. Remarkably, despite recent terrorist attacks and increased fear of terrorism, tourism performance of countries such as France, Germany and Belgium have not declined significantly, confirming a strong resilience of the T&T sector to security shocks, in presence of strong institutions and sound T&T fundamentals. While there are broad commonalities, large intra-regional diversity exists across the entire European continent. The strengths of a sub-region may be weaknesses of another. For instance, while Southern European countries tend to be characterized by stronger cultural and natural resources and tourism service infrastructure, their business environment, ground transport infrastructure and attention for environmental sustainability performance scores tend to be somewhat lower than those in Western and Northern Europe. These countries provide better enabling environments, including some of the most advanced ICT systems in the world, and better transport infrastructure, but have not developed their natural and cultural resources to the same extent. They also tend to be pricier destinations. In the Balkans and Eastern Europe, price competitiveness is a strength, but the sub-region has not yet invested enough in air connectivity and cultural resources. At the same time, international openness tends to be weaker than in Western Europe. The Eurasian sub-region also faces issues relating to international openness and transport infrastructure. Yet this sub-region boasts more qualified and efficient human resources while, at the same time, providing more price competitive options, thanks to lower hotel prices and fuel costs. Improvements in price competitiveness have occurred with different degrees of intensity, but have not been sufficient to harmonize prices region-wide. While Western Europe has made the greatest strides in improving this dimension, other sub-regions have followed suit—thus leaving average price competitiveness mostly unchanged. A similar dynamic has occurred- with the opposite trend effect- on ground infrastructure. Land travel has become slightly less efficient, on average, across all of the five Europe and Eurasia sub-regions. There has also been divergence at the sub-regional level for natural resources. While Southern Europe and Eurasia have become better at making use of their natural heritage, evidence indicates a decline in Western Europe. Spain maintains the 1st place globally in the global T&T competitiveness index. Spain’s success can be attributed to its unique offer of both cultural (2nd) and natural (9th) resources, combined with sound tourism service infrastructure (2nd), air transport connectivity (9th) and strong policy support (5th). Spain’s T&T sector has not only benefited from the recent ease of its fiscal policy, but also from diverted tourism from security-troubled Middle East. These developments, however, do not take anything away from Spain’s ability to provide an excellent environment for the T&T sector to flourish. The challenge now is to continue to find ways to improve, given the sector’s maturity. While Spain’s ground transportation is ranked in the top 15 economies, it has started to show signs of initial decline, suggesting that upgrades and modernizations are expected. In addition, the business environment (75th) can be improved, as dealing with construction permits remains burdensome (104th), and there is room to improve international openness further (43rd, down two places). France remains in 2nd position, withstanding the effects of the terrorist attacks of 2015 and 2016. Though this has led to lost ground (five places) on safety and security, international arrivals have remained stable. Cultural resources (3rd), ground transportation (7th) and air connectivity (13th) continue to drive France’s T&T competitiveness. Declines in security and in the usage of natural resources (to 13th, down 5 places) have been more than compensated by a significant reduction in the prices of hotels and ticket taxes, which have led to an improvement in France’s T&T price competitiveness by 21 places. France has improved its environmental sustainability (17th, up 6 places), by reducing the direct footprint of the sectoral activity on the environment and signing more environmental treaties. The business environment has also favoured investments in the sector, with lower construction costs (85th up 24 places), and more efficient private dispute settlements through the legal system (27th). While France may have lost T&T revenue over the past couple of years, it has continued to strengthen its T&T competitiveness fundamentals, making its T&T sector more resilient to shocks and primed to grow further in the future. 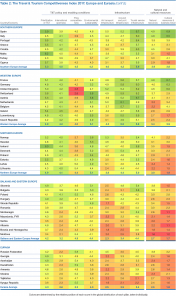 Italy sustains its 8th position globally despite its mixed performance. The country’s travel and tourism competitiveness is driven by its exceptional cultural (5th) and natural resources (12th) and world-class tourism infrastructure (11th), which continue to attract international tourists. In fact, in 2015, international arrivals passed the 50 million mark for the first time. There have been improvements, too, in ground infrastructure (22nd, up 10 places); human resources are more qualified and easier to manage (67th, up 8); and prices are more competitive (124th, up 9 places). However, the prioritization of the T&T sector has dipped (75th, down 10 places), due to lower commitment from the government (74th) and weaker brand strategy (75th). Safety and security has also deteriorated (70th, down 22 places), driven by lower perceptions of the reliability of the police and greater fear of terrorism and crime. The business environment remains weak (121st), with virtually no progress on the slow administrative procedures regarding construction permits (114th), the inefficient legal framework (134th) and business taxation (125th). Going forward, it will important for Italy to continue reinforcing its competitiveness and sectoral productivity to bring about development and growth through its T&T sector. Greece makes an impressive climb of 7 places to reach the 24th position in the global rankings. This performance is linked to Greece’s exceptional efforts to value its natural resources (32nd, up 14 places), both directly, via stronger digital demand (19th) and indirectly, through environmental protection (39th, up 22 places) and marketing activity (43rd, up 19 places). At the same time price, competitiveness has increased significantly (90th, up 23 places) thanks to declining cost of accommodation for international tourists, lower fuel cost and reduced ticket taxes and airport charges to incentivize tourism directly. These policies have contributed to generate more international arrivals, but have produced mixed results in terms of revenues. To not only increase arrivals, but revenues, Greece should focus on making its business environment (103rd) friendlier, with lower impediments to FDIs, reduced taxation on profits and enhanced efficiency of the legislative system. In today’s tech-savvy world, Greece also needs to become more ICT ready (51st). To date, businesses still make little use of new technologies for business-to-business (98th) and business-to-customer (82nd) transactions. Improving its visa policies (73rd) is another measure that would impact revenues and international arrivals with little financial investment required. Finland takes the 33rd position, down 11 positions from the previous edition. Despite the drop, Finland maintains its main competitive advantages: it remains the safest destination globally, notwithstanding rising concerns in most of Europe, including Finland, regarding terrorism. Finland continues to be one of the most environmentally sustainable countries (5th), with one of the strongest human resources and labour markets (6th), ICT readiness (6th) and efficient business environment (9th). Finland has also managed to make slight improvements to its price competitiveness (112th), thanks to lower hotel and fuel prices, but air connectivity options have declined significantly (30th, losing 7 places). Less available routes and operating airlines have impacted both arrivals (decreased by 6% decline in 2 years) as well as departures. At the same time, there has also been a decline in the attractiveness of Finland’s natural resources (76th), with the number of searches relating to natural tourism activities decreasing (61st). This may be due to less effective marketing activity to attract tourists (76th), increased competition from other destinations and weaker demand from traditional source markets. Restoring air connectivity and developing a new proposition that better values the natural and cultural resources of the country would be important factors to improve the competitiveness of the T&T sector in Finland. Azerbaijan (71st) is one of the most improved economies this year, rising 13 places in the global rankings. While Azerbaijan’s international arrivals decreased in 2015 as a result of an economic slowdown in the region, the growth of international arrivals since 2010, and the country’s investment in the sector, are consistent with the improvement in the rankings—and will certainly benefit the T&T sector going forward. Azerbaijan’s liberalization of its visa regime has led to an improvement in the nation’s openness (77th). At the same time the country has made efforts to enhance its natural and cultural resources by increasing the total size of protected areas (83rd) and actively promoting its oral and intangible cultural expressions (14th). Azerbaijan has become a cheaper destination thanks to a lowering of hotel prices (31st), and exchange rate fluctuations. Azerbaijan’s relatively safe environment (35th), flexible labour market (20th) and positive health conditions (37th) contribute to its growing attractiveness as a tourist destination. However, the country’s T&T competiveness could be enhanced even further by increasing air connectivity (currently ranked 77th), focusing on natural and cultural resources (109th and 69th, respectively) and developing and communicating entertainment and leisure attractions. 10 The tourists’ service infrastructure also registers a decline in several countries, but it is mostly explained by statistical or methodological nuances rather than by a clear decline in actual performances.